Which led me to think about why we have such a hard time proving the innocence of the network. And I think it’s because we have a problem with applications. Writing applications is hard. I base this on the fact that I am a smart person and I can’t do it. Therefore it must be hard, like quantum mechanics and figuring out how to load the dishwasher. The few people I know that do write applications are very good at turning gibberish into usable radio buttons. But they have a world of issues they have to deal with. Error handling in applications is a mess at best. When I took C Programming in college, my professor was an actual coder during the day. She told us during the error handling portion of the class that most modern programs are a bunch of statements wrapped in if clauses that jump to some error condition in if they fail. All of the power of your phone apps is likely a series of if this, then that, otherwise this failure condition statements. Some of these errors are pretty specific. If an application calls a database, it will respond with a database error. If it needs an SSL certificate, there’s probably a certificate specific error message. But what about those errors that aren’t quite as cut-and-dried? What if the error could actually be caused by a lot of different things? My first real troubleshooting on a computer came courtesy of Lucasarts X-Wing. I loved the game and played the training missions constantly until I was able to beat them perfectly just a few days after installing it. However, when I started playing the campaign, the program would crash to DOS when I started the second mission with an out of memory error message. In the days before the Internet, it took a lot of research to figure out what was going on. I had more than enough RAM. I met all the specs on the side of the box. What I didn’t know and had to learn is that X-Wing required the use of Expanded Memory (EMS) to run properly. Once I decoded enough of the message to find that out, I was able to change things and make the game run properly. But I had to know that the memory X-Wing was complaining about was EMS, not the XMS RAM that I needed for Windows 3.1. If the error messages are so vague when it comes to network resources and applications, how are we supposed to figure out what went wrong and how to fix it? I mean, humans have been doing that for years. We take the little amount of information that we get from various sources. Then we compile, cross-reference, and correlate it all until we have enough to make a wild guess about what might be wrong. And when that doesn’t work, we keep trying even more outlandish things until something sticks. That’s what humans do. We will in the gaps and come up with crazy ideas that occasionally work. But computers can’t do that. Even the best machine learning algorithms can’t extrapolate data from a given set. They need precise inputs to find a solution. Think of it like a Google search for a resolution. If you don’t have a specific enough error message to find the problem, you aren’t going to have enough data to provide a specific fix. You will need to do some work on your own to find the real answer. Intent-based networking does little to fix this right now. All intent-based networking products are designed to create a steady state from a starting point. No matter how cool it looks during the demo or how powerful it claims to be, it will always fall over when it fails. And how easily it falls over is up to the people that programmed it. If the system is a black box with no error reporting capabilities, it’s going to fail spectacularly with no hope of repair beyond an expensive support contract. It could be argued that intent-based networking is about making networking easier. It’s about setting things up right the first time and making them work in the future. Yet, no system in a steady state works forever. With the possible exception of the tar pitch experiment, everything will fail eventually. And if the control system in place doesn’t have the capability to handle the errors being seen and propose a solution, then your fancy provisioning system is worth about as much as a car with no seat belts. So, how do we fix this mess? Well, the first thing that we need to do is scold the application developers. They’re easy targets and usually the cause behind all of these issues. Instead of giving us a vague error message about network connectivity, we need more like lp0 Is On Fire. We need to know what was going on when the function call failed. We need a trace. We need context around process to be able to figure out why something happened. Now, once we get all these messages, we need a way to correlate them. Is that an NMS or some other kind of platform? Is that an incident response system? I don’t know the answer there, but you and your staff need to know what’s going on. They need to be able to see the problems as they occur and deal with the errors. If it’s DNS (see above), you need to know that fast so you can resolve the problem. If it’s a BGP error or a path problem upstream, you need to know that as soon as possible so you can assess the impact. And lastly, we’ve got to do a better job of documenting these things. We need to take charge of keeping track of what works and what doesn’t. And keeping track of error messages and their meanings as we work on getting app developers to give us better ones. 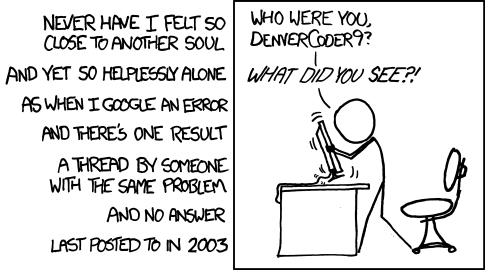 Because no one wants to be in the same boat as DenverCoder9. I made a career out of taking vague error messages and making things work again. And I hated every second of it. Because as soon as I became the Montgomery Scott of the Network, people started coming to me with every more bizarre messages. Becoming the Rosetta Stone for error messages typed into Google is not how you want to spend your professional career. Yet, you need to understand that even the best things fail and that you need to be prepared for it. Don’t spend money building a very pretty facade for your house if it’s built on quicksand. Demand that your orchestration systems have the capabilities to help you diagnose errors when everything goes wrong. This entry was posted in Musing, Troubleshooting and tagged Intent-based Networking, Machine Learning, Troubleshooting by networkingnerd. Bookmark the permalink. I find myself doing exactly what you described. I’m the CGSE (Certified Google Search Expert) for my company. Most days I’m either Googling to learn other teams applications or I’m using wireshark to prove their application isn’t doing what it says it’s doing. One thing I’ve noticed is that we need to better define what “the network” actually is. We get tickets all of the time because the error message said to contact the “Network Administrator” or the problem was with a “network drive”. We need better terms to help end users and helpdesk properly triage the issue. Once we have the terms, then we can rewrite the error messages.